Another late night, 2M, treadmill streak saver! Double UGH! Maybe I need the break and I'll come back fresher and faster. Combination of snow, ice and mental slump (caused by snow and ice). Was due to break the rut with Lydia asking me if she could do 12M with me (she has never run more than 10M before) before going to track in the evening, but she wasn't feeling great so we only did 4.5M in 53:00 (11:29 pace). 9.5M session on the track. 1M w/u, drills, 2M in 12:34 @133bpm (max 141); 3 x 2km in 7:00 (@146, max 154), 7:01 (@149, max 154) and 7:05(@149, max 153). Legs shot so did 4th 2km @6:16 pace and then another 1M @6:16 pace (94/lap) with "The Tank" after he did his 4th rep. Then 800m jog down. Not best pleased. Had hoped for some decent progress, especially after the previous easy days. Definitely aerobic (probably right under AnT), but still struggle with running 5:36 pace. Need more work at this pace to get the speed endurance up. And some faster VO2max running to get more comfortable at faster speeds. Was at a coaching course all day and snuck in another streak saver with Lydia in the evening - 3M. Neither of us 100% - my throat is a bit worse and her cough still there. 33:11 (10:55 pace). Started with a 2M warm up. Didn't check all the data until tonight - very glad I didn't. 8:59 pace; 103bpm. HR way too high. Still under the weather. And talking of weather, the snow has all gone and it is mild (10C). My stated goal for the race was to break the hour. I suspected, from the track workouts, that my anaerobic / lactate threshold was around 5:35-5:40 pace on a track. But I knew that I didn't have the speed endurance to hold that very far - certainly not to 10M and probably not to half way. In addition I knew there was a hill or two on the course. So I wanted to pace it so as not to slow too much in the latter stages and allow for a few hills - I figured the pacing would call for 5:50 or so and the hills would take it to 6mm pace. Total = 59:59 @147bpm (155max), 404ft elevation. Where to start with the race? Well, firstly, I was delighted. It was a good result while under the weather that suggests better progress than I had thought (maybe I was under the weather for track on Thursday too). Can't read too much into each mile split as, even with elevation info, you cannot see the crazy wind nor the road surface. What you can see, however, is the HR dropping in the second half and especially in the last 2M. And that was, in a nutshell, what happened. I started out much faster than I expected and felt very comfortable both aerobically and biomechanically (always a surprise!) for the first half. The HR inevitably dropped on the 4th mile which was downhill, but otherwise I was good for the first half - longer than I had expected to be and at a faster pace. On the first big hill in the 5th mile I hit my highest HR in the race and was probably bang on AnT / LT - what was really encouraging was how comfortable I was feeling just a few bpm lower. 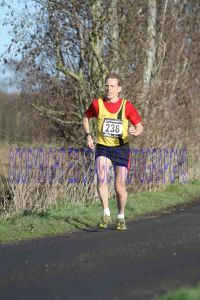 In the second half, bit by bit, my lack of speed endurance (the ability to hold a pace) started to show. The lower HRs were indicative of me just not being able to continue to work the legs hard enough. Over the last 2M in particular the wheels came off, so to speak. And I got passed by 3 people in the last 400M! No gears left, legs not going any faster and very comfortably aerobic! I finished 15th overall (out of 771 finishers) and was 4th Vet (40+) - missing out on a County medal by less than a minute. Overall, though 40ft/mile is nothing compared to my ultra races this coming summer, it was fairly hilly and definitely nothing vaguely close to PB chasing territory. Add in a muddy, potholed farm lane for decent sections and some really nasty wind and you had a slow course. At least 2 min, I would estimate, maybe even 3, probably 2.5 - which puts me at PB levels or thereabouts (57:36 from 2005). Good training session for future progress - will help me get more used to holding this kind of tempo effort for longer. I am likely in 5:45 pace shape for 10M when in good health and on a fast course - much better than expected. I am feeling as comfortable biomechanically at that kind of pace as I ever have done. Keep working at AnT and speed endurance on Thursday nights with the club. Get some VO2 Max work and some hill reps done to enable pace to continue to improve. Had this scheduled but got lost in snow and ice, plus my inability to get to club training on Tuesdays due do daughter's ballet lesson. No excuse now snow has gone. Get the mileage back up after "down week". Next race is another County Championship - the Deal Half Marathon in just 2 weeks time. Another hillier course, I am hoping to run around the same pace (6 min/mile). To hold the same average pace for a race 3 miles longer would require a chunk of progress, but I think it is achievable so long as it is not too much hillier. Then, after another "C-" jaunt at the Gravesend Cyclopark, comes my first "B" race of the year and a third County Championship, the Thanet 20M, which is a much faster course and 5 weeks away, may afford me a chance to crack the magic 2hr barrier if things keep progressing. And all this is working towards my first "A" race of the year - a crack at a sub 75min Half Marathon (5:44 pace) in April at Paddock Wood (a more reasonable 13ft/mile of elevation). A tough target, to be sure, but one that I think I am on track to have a decent chance of realising. The glass is half full tonight.